The world's most perfect meal is beer and French fries, that is, if you have them at Wild River Pub in Grants Pass, Oregon (above). The beer would be one of Wild River's own, not just those on the list but specials like coffee stout (above), as dark and heady as your morning Joe. Beer gets into the French fries too. It's been sprinkled over the hand-cut unpeeled fries in the basket above. After a dusting of flour, they're fried, popped smoking hot into the basket and rushed to the table with pots of ranch dressing for dipping. Eating the fries is pure bliss, but if you're not satisfied, you can move on to another beer-laced treat, Wild River's wood-fired pubfectionist pizza (above). Its marinara sauce is infused with hand-crafted Extra Special Bitter pale ale, which is as bitter as you could hope for. The marinara goes over a thin, crisp crust along with baby spinach, bacon, breaded chicken, garlic, mozzarella, Italian seasoning, freshly grated Parmesan and, at the end, fresh basil. The pub is a smaller, cozier place than Wild River's main restaurant in Grants Pass, where the brewing takes place. It has a communal table, a pool table, a bar where locals hang out and a back wall that amounts to a communal art exhibit (above), with personal messages scrawled alongside Wild River coasters. Wild River Pub and Publick House, 533 Northeast F Street, Grants Pass, Oregon. Tel: (541) 474-4456. The birria in my taco was so good that I begged for the recipe. I was eating at Los Arcos, a Mexican restaurant in Medford, Oregon. People who like really good Mexican food drive miles to eat there, and one of them told me about the place. Located on the edge of town in an industrial zone, Los Arcos has something rare in this region--handmade tortillas. Women come in to pat them out on weekends. But any day the restaurant offers delicious tacos, chiles rellenos (made with fresh poblanos). barbacoa, carnitas and many other dishes, all produced from scratch. The Thursday I was there, the specials were menudo, caldo de pollo (chicken soup) and chicken burritos. I opted for tacos (with a relleno on the side), because my informant had said they were so good. And the sign on the wall outside indicates that Los Arcos is an "autentica taqueria Mexicana" (authentic Mexican taco shop). The tacos were small, presented open faced with the meats and a good fresh green salsa on top. Carne adobada (marinated pork) was more delicate than the robust, spicy meat that I am accustomed to. Carne asada was fine, but the birria stood out. The flavors of tomato, chiles and seasonings blended in perfect balance without any sharp intrusion of chile heat or strong spice. The meat was beef, not goat or lamb as is usual in Jalisco, the state in Mexico where birria originated. Beef birria is not unknown there, so this was not a "foreign" adatation. The cook, Leonarda Gonzalez, is from Zacatecas, a state that borders Jalisco. Her husband Martin, who owns the four-year-old restaurant, is from a town near Tepic, Nayarit, which also borders Jalisco. Leonarda was not in that noon, but their son Martin, who was in charge, picked up his phone and called for the recipe. And she obliged, although it was probably a challenge because she cooks without measuring. Here is my interpretation of Leonarda's birria. It may not be quite the same, given the way I had to guess at quantities and procedures, but it is delicious in its own right. Lightly coat a heavy griddle with oil and heat over medium high heat. Place the chiles on the griddle and roast for a minute or two, until fragrant but not browned. Place the chiles in a saucepan and cover with water. Bring to a boil. Remove from heat and let stand until soft, about 20 minutes. Meanwhile, roast the tomatoes, onion and peeled garlic cloves on the griddle until spotted with brown. Remove from the griddle. Pull off any loose skin from the tomatoes. Drain the softened chiles, reserving 1 cup soaking liquid. Remove the stems. Open the chiles and rinse to remove the seeds. Combine the chiles, tomatoes, onion and garlic in a blender container and blend until smooth. Pour into a sieve set over a bowl. Rinse out the blender with ¼ cup reserved soaking liquid and add to the sieve. Puree the mixture through the sieve, discarding the solids that remain. Place the beef in a large saucepan. Cover with water and bring to a boil. Boil 1 minute. Pour into a colander and rinse well. Return the meat to the cleaned pan. Pour the chile puree into the saucepan. Rinse out the bowl with the remaining chile soaking liquid and add to the beef along with 1 cup water. Add the vinegar, bay leaves, marjoram, cinnamon stick, peppercorns, beef bouillon cubes and salt. Bring to a boil, reduce heat, and cook at a gentle simmer, loosely covered, 3 hours. If the heat is low enough, it should not be necessary to add more water. Take out the meat, place on a cutting board and shred, using two forks or a fork and a sharp knife. Return to the pan and simmer for 30 minutes, mixing with the sauce. Eat as a main dish with rice, or use as taco filling. For tacos, place the meat on top of hot, soft corn tortillas and top with chopped onion and cilantro, then fold and eat. The beef is not spicy, so accompany the tacos with hot salsa to add as desired. Makes slightly more than 3 cups, enough for 12 tacos or 4 servings. Los Arcos Restaurant, 1501 Sage Road, Medford, OR. Tel: (541) 773-8226. The red wine that I am drinking tastes like a bowlful of gorgeous fruit—raspberries, cherries, jewel-like pomegranate seeds. It is Cacc’e Mmitte di Lucera DOC (Albert Longo) 2005 from the region of Puglia (Apulia in English) in Italy. But it tastes like a sunny summer day in California. The reason I am tasting this wine is that a trade mission from the province of Foggia in the northern part of Puglia has come to Los Angeles to show off the region, its wine and food. Puglia’s most important product is olive oil. Green gold, they call it. And this wine is red gold. It is made from Uva de Troia grapes combined with other grapes such as Sangiovese, Malvasia and Trebbiano. We drink it with appetizers—deep fried artichoke hearts, marinated mozzarella, tiny meatballs and sandwich-like canapés filled with eggplant and ricotta. And we drink it with lunch, along with a golden white wine, Le Fossette, made from the Falanghina grape, which dates back a couple of thousand years. A bottle of Sciroppo extra virgin olive oil, produced in Foggia, is also on the table, and we pour green-gold pools of it onto plates for dipping bread. Lunch, at Valentino in Santa Monica, is composed of Puglia specialties. 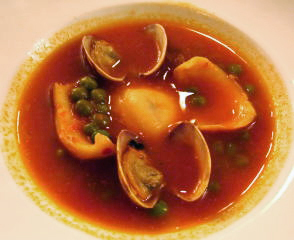 A baby octopus and clam soup reflects the region’s involvement with the sea. Located in what is the heel of Italy’s boot, it has the longest coastline of any mainland region and faces two seas, the Ionian and Adriatic. Durum wheat and tomatoes are important products in Puglia, and these are combined in the next course, orecchiette pasta with ricotta cheese and fresh tomato sauce. 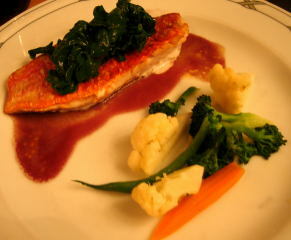 Then come the main dishes-- red mullet topped with organic spinach that has so much body it seems more like chard and beef roulades filled with a crea my puree of broccoli rabe, a vegetable that is cultivated in Puglia. Dessert is a Puglia style doughnut that looks like a small, round, puffy churro, flanked by pistachio and chocolate gelati, berries, cookies and a tiny golden circle of passion fruit sauce. 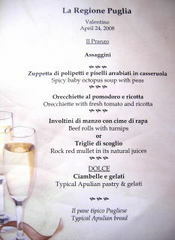 Puglia cuisine is a rich blend of historic influences—Greek, Roman, Macedonian, Turkish and more. The region is proud of its artisanal foods, prepared by small family operations in accordance with generations of gastronomic tradition, and we look at displays of olives, roasted tomatoes, vegetable preserves and pasta. But olive oil is the star, because Puglia is the largest producer not only in Italy, where it outdoes Tuscany, but in the entire Mediterranean basin—possibly even the world, as its enthusiastic representatives let us know.